It's been a wonderful year-and-a-half on Elm Street ... It's our last couple of days in the 1408 Elm Street Gallery. Stop by and see some incredible works, before we close this space. We'll be open all day tomorrow and Saturday. 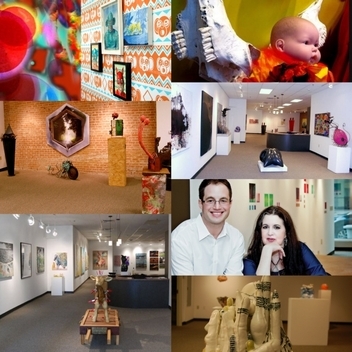 Our programming continues at Ro2 Art Downtown - 110 North Akard and locations offsite, with GREAT shows lined up! Keep track to find out where the gallery goes next! For our last weekend at the 1408 Elm Street Gallery, we are featuring several new works and favorites -- including sneak peak installations by Chance Dunlap, Kathy Robinson-Hays, and Terry Hays of works in progress -- never-before-seen insights into incredible installations that will be on view over the coming year. The gallery closes on April 21 -- after which Ro2 Art will continue with shows at our project gallery at 110 North Akard and exciting offsite projects . . . until our next spot opens up! and a special closing event . . .
Join us for a triple celebration - the culmination of a successful venture at the gallery on Elm Street and a double birthday party for Lisa Hees and Jordan Roth. We want all of our great friends and supporters to join us! 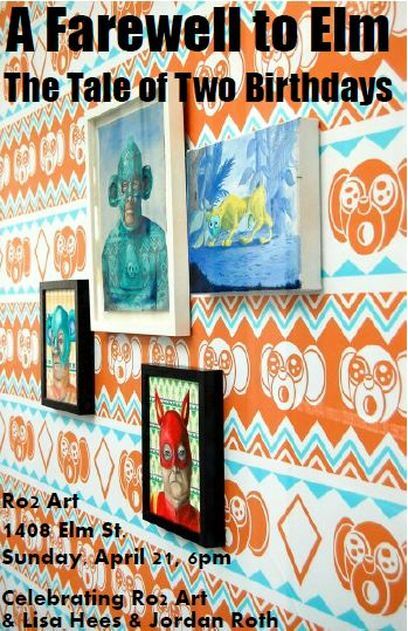 Festivities begin Sunday, April 21 at 6pm at Ro2 Art - 1408 Elm Street.